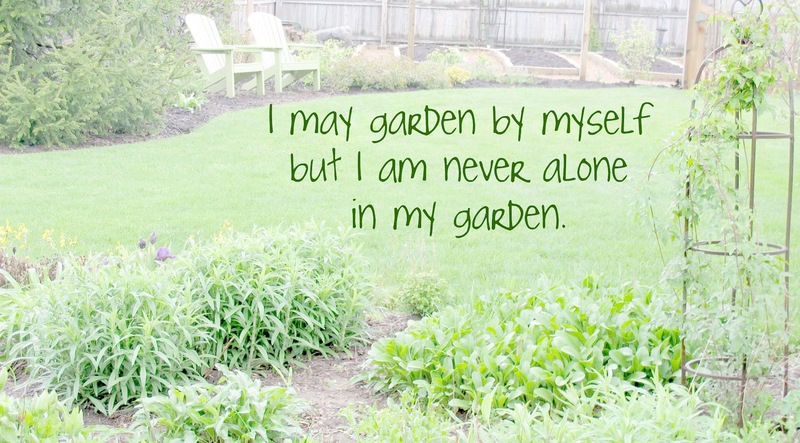 I may garden by myself, but I am never alone in my garden. When I am working in my vegetable garden, I can feel my Dad standing beside me, admiring the neatness of the raised beds. I'm sure, too, that he is pleased that I still stake my tomato plants, just like he used to. 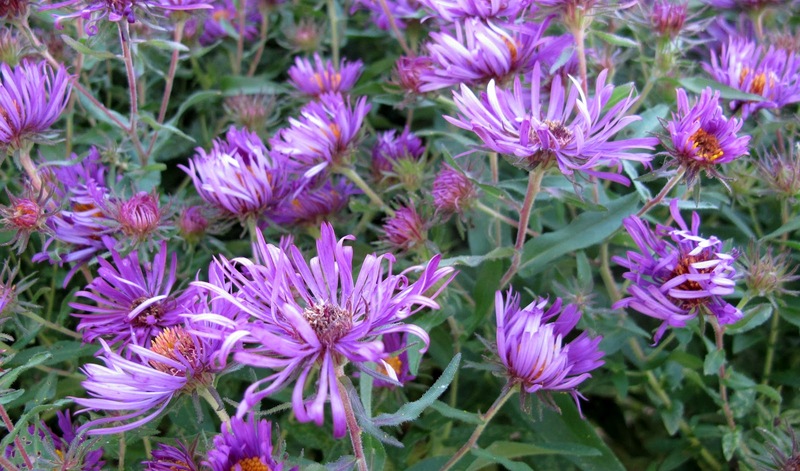 When I see the asters blooming in the fall, I think of my aunt, who gave me the asters many years ago. She would enjoy seeing all the other flowers in my garden, too. When I look at the snowball bush viburnum blooming in May, I am reminded of my maternal grandmother, who had a "snowball bush" in her garden. I think of her, too, when the lily of the valleys bloom and recall the many bouquets of these flowers that we picked for her when my siblings and I were little kids and visited her each Sunday. When I pick that first 'German Johnson' tomato, I think of my paternal grandmother, a Johnson who married my grandfather, whose relatives all came from Germany. When I pick hot peppers, I remember this grandfather, who ate hot peppers at nearly every meal. When I plant tulip bulbs in the fall, I recall stories of a great-grandfather who planted many tulips around his home, claiming them as a favorite flower. And when the violets bloom, I think of my own mother, who loved the little purple violets, most especially those we picked for her. I could never rid my lawn or garden of violets - what would Mom say about that? 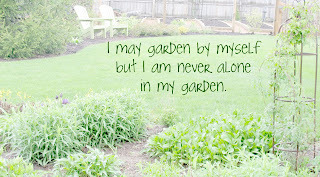 Yes, I may garden by myself, but I am never alone in my garden. I love gardening with my family. I have many - MANY - plants from my parents' old garden, from my grandmother's garden, from my husband's grandmother's garden and so on; it's a veritable heirloom treasury, and it means so much more than if it had all just come from a nursery. Carol i completely understand what you are talking about. whenever i look at, or do anything related to my orchids i think of my dads mother, whenever i look at the violets i think of my mums mother because her garden is full of them, whenever i build something in the garden i think of dad's dad, and then there are all the plants and cuttings that i have gotten from family and friends, and i can remember where each and everyone came from, isn't gardening a brilliant thing? That is so sweet. I love to be playing in the dirt and when I'm not able I sure do know that I need it. Thanks for sharing. Have a great day. 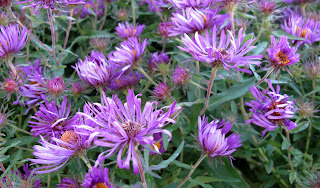 How wonderful to have those memories of loved ones and ancestors who also loved flowers and gardening. They do keep us company, at all times, but especially in the garden. Isn't that the truth. One of the best parts of my gardens are the peonies that came from my husband's grandmother's farm, the old, old variety of sedum that came from my mother, the trumpet vine from my grandmother (we call her Simone) and of course all the beautiful plants that were shares from my friends. I wonder if anyone gardens alone in their garden? It seems that every gardener I've ever talked to can point to someone, usually a relative, who inspired them to garden themselves. What a beautiful post. What many non gardeners don't understand is that our gardens are more to us than just a collection of plants. You've articulated this very well with this post which makes us think of our own garden friends and family. Thanks! Lovely sentiments, Carol. You garden the way I garden... with a whole host of beautiful memories as my companions. Certainly my parents who have now passed on, but also my children who are now making gardens of their own in far away places. Too me, that's what makes gardening so delightful. Thanks for a sharing a sweet post that brought a smile to my morning. I really enjoyed your blog, thanks for sharing special moments with the special people in your life. So endearing. Although my parents are gone, they are with me in my garden every time I'm there. I really love this page. I enjoyed gardening all the time. It is our bonding time with my kids. So cool! Thanks a lot for the page. Ah, nice to find that you are still blogging. I have been reading, once a day, your grandmother's diaries, and enjoying them very much. Thank you for sharing. Wonderful post! I think it is lovely that you have so many people to enjoy the garden with you even if it is only in spirit! Gracious, what a beautiful post! I, as well, am never alone among my grandmother's sedums and my father's iris.